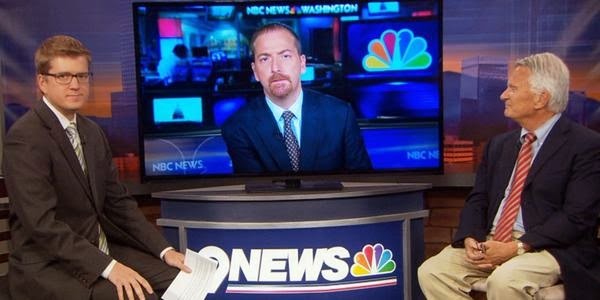 In discussing the Colorado midterm election, Meet the Press host Chuck Todd saw the fate of Governor Hickenlooper very much affecting the Democratic ticket in Colorado, including the U.S. Senate and 6th Congressional race. And, he said Hickenlooper is in trouble. I believe the senate race will remain close the next couple of weeks before voting begins, but that foreign policy could be a sleeper issue that affects the race. President Obama’s approval is 35% among Colorado voters. His approval among independent voters is only 28%. After a multi-million dollar ad campaign, Udall only wins women by 10 points over Congressman Cory Gardner, but loses men by 16 points. Udall’s dominant campaign strategy, “the war on women,” may have reached a saturation point and may be producing a backlash, especially among men. Voting in Colorado starts October 15 with a new Democratic-inspired universal mail-back ballot. This should benefit campaigns with the best get-out-the-vote efforts, which in 2014 are massive, expensive computer- and online-driven productions. But, they include the candidate walking or phoning voters one at a time. 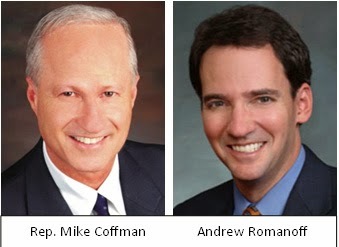 Mike Coffman and Andrew Romanoff are full at it in Aurora battling for voters in one of the county’s closest contests. Floyd Ciruli, a nonpartisan Denver-based political consultant, said even in a race where only a couple thousand votes could decide an election, canvassing alone does not translate directly into a win. But he said Romanoff is gaining an experience he can talk about in a campaign ad or at a future debate with his opponent. In turn, Romanoff’s campaign is gaining information about a potential voter. The Coffman campaign is on the streets, too, gaining the same intelligence, and not gaining the same sure-fire win. It’s not uncommon for campaigns from both parties to cull state voter data for their door-to-door efforts. The sorting often involves targeting registered voters who are unaffiliated, key constituencies or those who have voted against their party in recent years. Ciruli said that whatever Romanoff learns about unique voters while canvassing will be added to lists the Romanoff campaign uses when ballots are mailed to voters. In the only public poll so far in the 2014 campaign to cover Colorado ballot issues, the USA Today/Suffolk poll found two of the four Colorado ballot issues losing and two winning. The perennial loser, “personhood,” is behind 10 points, 35 percent to 45 percent. It has lost twice before by large margins and is expected to do so in 2014. Coloradans haven’t been generous to gaming expansion beyond the current footprint of small mountain communities. But, that doesn’t stop out-of-state interests from trying. This year, it is being sold as a boon for public education funding. It is losing by 11 points in the early poll, 33 percent to 44 percent. Finally, Jon Caldera appears to have a ballot issue that could pass – a miracle. Open meetings for school boards and labor negotiations has a 20-point lead as it sounds attractive to voters. Expect the Colorado Education Association to weigh in with an effort to defeat it. Their view is secrecy produces better deals than transparency. Labeling genetically modified food is ahead by 15 points. Voters like more information as consumers than less. Expect Colorado’s substantial food industry to express a view as to why it’s a bad idea. The race for U.S. Senate took a sharp turn last week when two post-Labor Day polls shifted to likely voter models and showed Senator Mark Udall behind by 8 (Quinnipiac) and 2 (USA Today/Suffolk) points. Democrats and their friends declared the polls outliers, especially the Quinnipiac survey. A new poll done by a Democratic research firm adds its weight to the view Udall is behind. PPP reports a September 21, 2014 poll of 652 likely voters that Gardner leads 47 percent to 45 percent. The independence movement in Scotland is part of a European phenomenon that, while uniquely Scottish, shares many aspects of other recent European protest parties and movements. 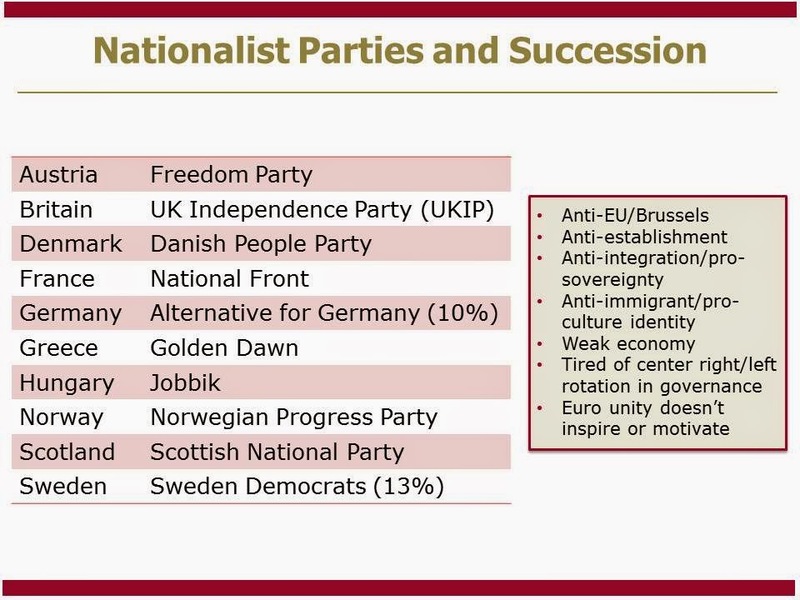 It was seen in most dramatic fashion in last spring’s (May 2014) European parliamentary elections where anti-integration parties won a quarter of the representatives. The final Ipsos/MORI poll, a British gold standard, called the race 47 percent “yes” and 54 percent “no” and a 6-point difference Wednesday night. The result was 10 points. Men and younger voters were more in favor. It was a battle with a lot of emotion between the heart and the wallet, with women and older voters believing the change involved too much risk. The independence movement appears to have many aspects of the sentiment seen throughout the developed world that is anti-establishment and, in this case, anti-Westminster. Late deciders. The common experience in ballot initiatives is late deciders stay with the status quo. Also, some voters may say they support independence (i.e., change), but pull back when looking over the cliff (bungee jump; i.e., the no jump vote). Shy voters. 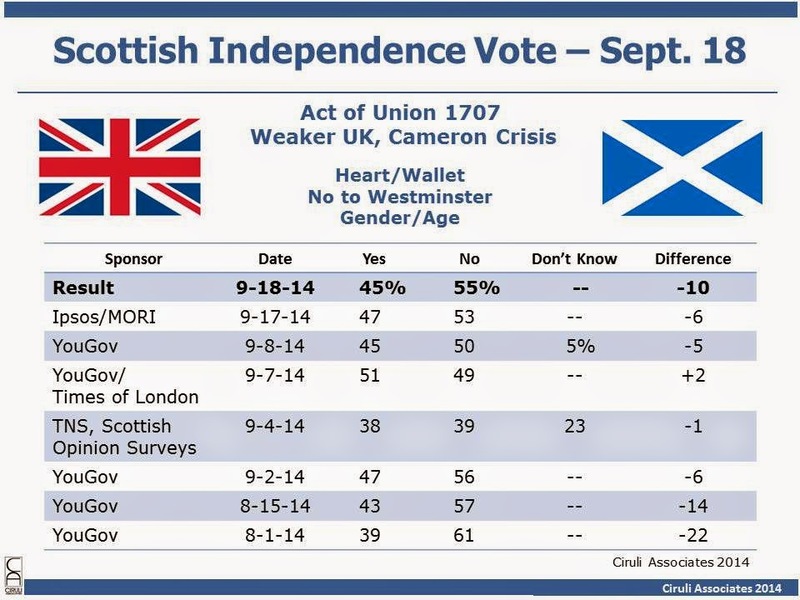 Some voters are not willing to tell pollsters they plan to vote against independence. Turnout. There appeared to be some fall off in turnout among independence supporters. Democrats may only lose three or four U.S. Senate seats if they can continue to localize the races and run aggressive, well-funded campaigns. Kay Hagan is now ahead in North Carolina, a seat Republicans were hoping to capture, and Colorado’s Mark Udall had a beyond the margin of error lead in most polls (not in the recent Quinnipiac survey, but it has been criticized because of the size of the lead, 8 points, for Cory Gardner and some sample issues). But, neither Hagan nor Udall can be comfortable due to President Obama’s low approval rating and the recent shift to the Republicans in the generic ballot test. The generic ballot test has also started to move toward Republicans since early September as the President was running to catch up to the ISIS threat. It now sits at four points to the red, which is less than 2010, but it is still an indicator that 2014 will be the year the Democrats’ brand won’t help. As of today, it’s not clear the negative national numbers will be enough for Democrats to lose six senate seats, but they are enough to make Democrats run scared. After years of delay and many polls indicating defeat, Governor Brown and the California legislature have crafted a $7.5 billion water bond for this November’s election that is ahead in the latest Field Research Poll by nearly two-to-one (52% to 27%). People who have some knowledge of the bond are even more supportive (57% to 25%) than voters less informed (48% to 28%). Somewhat surprisingly, Democrats are more supportive (66% to 13%) than Republicans, who oppose the bond at this time (35% to 49%). Also of interest, the proposal is winning urban areas that usually disagree on water issues. The bond is passing by 62 percent in the Bay Area and 56 percent in Los Angeles County. It is ahead by less of a margin in the Central Valley (43% favor, 31% against). A very popular governor advocating for it (Governor Jerry Brown has a 16-point lead over his Republican opponent). (As you know) Proposition 1 is the Water Quality, Supply and Infrastructure Improvement Act of 2014. It authorizes 7.5 billion dollars in general obligation bonds for state water supply infrastructure projects, including surface and groundwater storage, ecosystem and watershed protection, and restoration and Bay-Delta Estuary sustainability. Fiscal impact: Increased state bond costs averaging 380 million dollars annually over 40 years. If the election were being held today, would you vote YES or NO on Proposition 1? At the recent World Public Opinion Research Association (WAPOR) meeting in Nice, France, the Middle East was a major topic with many public opinion experts from Middle Eastern countries in participation. One of their major themes is that a considerable amount of the polling that Americans and the West in general sees from the area fails to reflect the dramatic differences in the 350 million inhabitants spread from Tehran to Cairo, Istanbul to Riyadh. They also believe that many of the surveys, especially as it relates to the Arab-Israeli conflict, fail to offer sufficient balance. There was disagreement on that point, but general agreement that more nuanced and in-depth analyses are needed. In the winter of 2014, as this proposal was being written, it was clear the Syrian Red Line decision had caused a major increase in worldwide elite conversation about Middle East foreign policy and the administration’s handling of it. 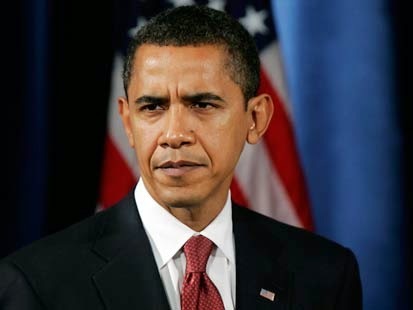 In September 2013, President Barack Obama had few good military or diplomatic options for the chemical weapons crisis in Syria and even less public opinion support for the options being considered. However, in late 2012 and early 2013 national public opinion polls showed that many elements of the President’s range of action, including military and other aid to Syrian rebels, had public support. One of those options was taking offensive action if the use or movement of chemical weapons was detected. This paper will trace the evolution of public opinion from the reluctant support for various military options early in 2013 to the foreclosure of all military actions in September 2013, leaving the President and his national security team in a public opinion cul-de-sac. Obama was only able to break out of this position with a serendipitous lifeline from Russia. The conclusions from the presentation assert that the Syrian decisions of the administration were a tipping point in their foreign policy confidence and they are still on the defensive. Two new polls since Labor Day added confusion and some suspense to Colorado’s top two races. 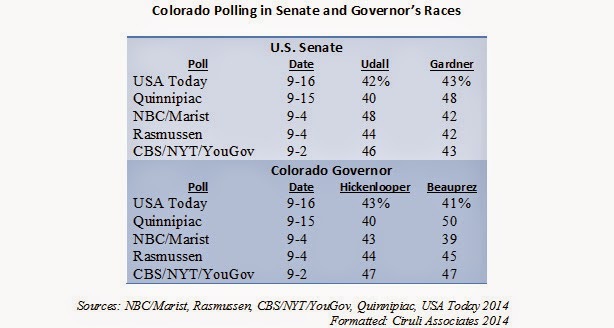 Quinnipiac and the USA Today/Suffolk polls put challenger Cory Gardner ahead of incumbent senator, Mark Udall. The same two polls split on the governor’s race, with Quinnipiac claiming incumbent John Hickenlooper is ten points behind Bob Beauprez and USA Today/Suffolk claiming Hickenlooper is two up. Due to the spreads in the Quinnipiac poll results, both races move to toss ups among national handicappers and polling aggregators. Needless to say, the Democrats criticized the sampling of the Quinnipiac survey and claimed the leads of their two candidates were maintained. The senate results are the most interesting since both polls, done by university research units, claim Udall, after nearly being declared the prohibitive favorite to win, is now in trouble and may not have a lead in the race. Obviously, more public polling data will be needed to sort out the race, but for now the narrative has changed. It provides a burst of momentum for Gardner and reopens speculation on the impact of growing dissatisfaction for Washington since President Obama’s September 9, 2014 prime time White House speech on the war in the Middle East. The Obama Policy of Restraint – What’s Next in American Foreign Policy? Two hundred of the world’s leading public opinion experts gathered in Nice, France, September 5 and 6, to share new data and analyses concerning the profession and public opinion trends. Among the major topics was the expected close vote related to Scottish independence, a major blow to Great Britain. The second was the NATO meeting in Scotland that was focused on the latest foreign policy challenge from Russia and ISIS. DU’s Crossley Center of Public Opinion Research presented a paper entitled: The Obama Policy of Restraint – What’s Next in American Foreign Policy?, which drew considerable interest and discussion. The topic proposal for the World Association of Public Opinion Research (WAPOR) was drafted last winter as Vladimir Putin was annexing the Crimea (March 18). The action of the Obama administration the last week has highlighted this discussion as part of today’s news. In 2009, Barack Obama begun his presidency and foreign policy with immense fanfare and high levels of support from the world public and the capitals of major powers. Today, that support is muted and criticism from world leaders is growing. World opinion has swung from relief over the end of the unilateral “cowboy” policy of President George W. Bush to anxiety over the perceived reluctant and hesitant policies of President Obama. A similar shift is noticeable in American public opinion. After the expansive military and democracy-building policies and rhetoric of the post-9/11 era, America welcomed the withdrawal from two active wars in Iraq and Afghanistan and preferred a focus on domestic issues. But recently, public disenchantment appears to be growing over America’s position in the world. Support for President Obama’s diplomatic strategies in Syria and Iran is low, and domestic foreign policy critics have intensified their opposition. Is American foreign policy reaching a new inflection point where the recent non-intervention and restrained policies of the Obama administration are being effectively challenged or will there be another decade of American non-intervention? Jeremy Meyer reports that nearly $13 million has been spent in 2014 on 23,000 political ads. About two-thirds came from “independent” outside groups. The amount spent on TV continues to climb ($10 million in 2010) in spite of fragmentation of television and many alternatives. Ciruli also keeps predicting an end to the TV ad gravy train. 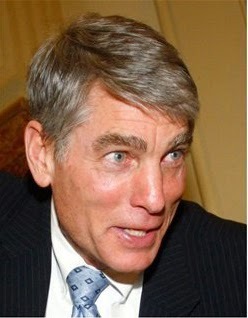 Mark Udall is in a very difficult race for re-election. His share of the vote has exceeded 50 percent only once out of 15 surveys since March 2014. With massive negative advertising, Udall and supporting independent organizations have opened a gap of four points on average over Cory Gardner. But, as the Denver Post reported last week in their poll, the race could go either way. Democratic senators in 2014 re-elections were elected, and in Udall’s case, first elected with President Obama during his election in 2008. And in spite of herculean efforts to separate from him, Udall is still highly affected by both the normal midterm association with the incumbent president and specific problems, such as ISIS, immigration and the Affordable Care Act (ACA). The President has lost the confidence of the public on foreign policy and his rush to catch up may not change enough opinions that the ISIS problem was partially his fault and, in any event, he was slow to react. Immigration, which was to be a Democratic asset in this election with Anglo voters supportive of a path to citizenship and Hispanic voters anxious for a promised presidential remedy for large-scale deportations. Now, both groups are dissatisfied with the President as he has delayed his deportation relief and the surge to the southern border has shifted Anglo opinion to border enforcement from citizenship. The ACA continues to be unpopular with the public. Pew Research reports it is approved by 44 percent of the public and disapproved by 53 percent. The three issues have the possibility of pressuring independents to oppose Udall and Hispanics to just not vote. The Real Clear Politics generic ballot test average has just jumped from a percentage point for Democrats, where it sat for the entire spring and summer, to four points for the Republicans since September 6. The last time the Democrats won a single test was a USA Today/Pew Research poll on August 24. And clearly the President and foreign policy have been driving the polls with the President’s August vacation and the crisis in Iraq with television coverage of beheadings. The generic ballot test, along with the presidential approval, contributes to the forecasting of the midterm elections. Pew Research reports on September 12 that Republicans have a three-point advantage with likely voters on the generic ballot test. They point out that Republicans had a seven-point advantage in September 2010 when they retook the House and a six-point advantage just prior to 2010 Election Day. The New York Times forecasting unit, called The Upshot, gives Republicans a bare 51 percent advantage to win the six seats needed to take control of the U.S. Senate. It had been more than 60-40 from mid-August to early September. But, as the forecast models have shifted from historic data (i.e., who won the state, Obama or Romney) to current polling, Democratic prospects have improved. Mark Udall is one of the Democratic incumbents who have moved from toss-up to likely winner in most forecasts. Each new reported public poll is increasing his odds of winning. He’s now 82 percent likely to win in the Upshot model. Although, they still have Udall on their competitive list. Presidents can get a surge of support in national crises as they take action. President Obama was overdue to look presidential as he did in his ISIS speech last Wednesday. However, early returns show no change in his approval numbers overall (42% average now) or in foreign policy (32% in WSJ/NBCpoll, 9-9-14; 34%, 9-13-14). In a follow-up poll (9-13-14), the Wall Street Journal shows more than 62 percent of the public is supportive of the plan. But, 68 percent are skeptical it will work. If the plan has problems in implementation, Republicans and independents may fault him for poor leadership. Democrats, who are still mostly supportive of him, remain ambivalent toward more military action in the Middle East. Local Democrats, like Mark Udall and Andrew Romanoff, could suffer if the President’s leadership appears weak. The announcement of a strategy that has some preliminary support from Republicans could swing attention away from the speed of the response. In every recent election cycle it has appeared incumbent U.S. House members were in trouble and could be voted out of office simply because they were the current officeholder. It never happens, although there have been years when a few more incumbents lose primaries and general elections. But, it’s still a rare event. The speculation has been stronger this year because incumbent approval and re-elect questions have been at historic lows. Also, the dislike of Washington D.C. in general and both parties is high, apparently mitigating the normal tendency in midterm elections to reign in the incumbent president’s party; i.e., in 2014 a vote against Obama and for Republicans, including incumbents. In Colorado, do Republican Congressman Mike Coffman and Democrat Senator Mark Udall run with the 2014 incumbent disadvantage? Both of their opponents are making use of “it’s time for a change” and “Washington is the problem, not the solution” themes. Congressional approval 14%. Lowest Gallup midterm measure since 1974. Lowest point of 9% reported after shutdown in November 2013. Favor parties: Democrats – 49%, Republicans – 35% (ABC/Washington Post, 8-5-14). Last low point for Republicans in favorability was the shutdown in October 2013 (32%) and impeaching Clinton in December 1998 (31%). On September 9, there was more panic in the White House than at ISIS headquarters in Raqqa. The President’s team knew they were in trouble on foreign policy as his competence numbers kept falling over the summer. Democrats, like Senator Dianne Feinstein, took up criticism and the ongoing crises in the Syria/Iraq became personal and visual with the beheadings of Americans. The administration’s political and foreign policy team saw their time was running out after the rapid criticism of the President’s comment that they lacked a strategy. But it was the arrival of new round of polls that put the entire Democratic establishment on notice that foreign policy could become the coup de grâce in an already terrible midterm election environment that finally rushed the President to announce he was shifting from his policy of restraint to one of action, even if cautiously defined. Could foreign policy produce the wave? Although most indicators do not show a wave of support for Republican candidates today and foreign policy is not usually an issue in midterms, the latest polls suggest the public is so concerned about the administration’s poor performance that they may take it out on Democrats in November. The American people have moved much more rapidly than the administration on desire for a plan and leadership. President Obama and his team have been mostly on the defensive since the mixed signals and changed direction in the Syrian Red Line decision one year ago. 70% say ISIS threat to U.S.
70% believe ISIS could launch attack on U.S.
At a world conference of pollsters last week, the biggest topic was not ISIS or Ukraine, but new polls showing Scottish nationals closing the gap and even taking the lead for independence from Great Britain. The new British-based poll using online panels has been dominating the news, and YouGov reports the gap between yes and no shrunk from 22 percent to 6 percent and then reversed last weekend. The election is Thursday, September 18. Anything that diminishes our strongest ally hurts us. It’s another problem for President Obama who needs Prime Minister Cameron leading Britain and rallying Europe behind the ISIS and Russian initiatives. If the vote is for independence, Cameron could lose control of his party and next May’s UK election. Frank Bruni in the New York Times describes Colorado as more of a swing state than Ohio in spite of a couple of big Barack Obama wins and politically easier to promote lifestyle changes, like drugs, than California. That’s mostly correct and mostly old news. 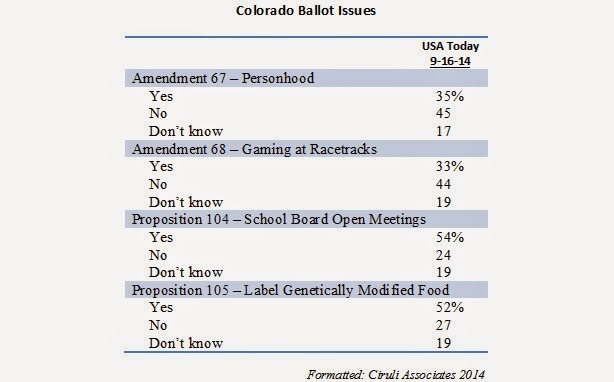 Colorado is closely balanced in its partisanship and ideology. While it likes moderation, it swings right and left with persuasive candidates and shifting issues. In 2010, Colorado was a Tea Party state, now it’s less so. Colorado is very independent. It’s likely to give a new idea a forum and sometimes a platform. Ross Perot was welcomed in the 1990s as was tax limitations and anti-gay initiatives, but in the 2000s, gay rights recovered and medical and recreational marijuana were popular. Colorado’s western outlook is often anti-establishment. Libertarianism is a popular theme, if only a minor party. The state likes term limits (second to adopt), tax limits (nation’s most severe) and lobbyist spending limits (most picayune). The state has a few powerful media outlets and a very engaged civic community. When things appear completely out-of-kilter, they tend to react. Anti-growth and anti-energy development initiatives have been resisted as have anti-government financing initiatives, all of which have passionate, if narrow, constituencies and a very friendly initiative process. In light of this swing state phenomenon, Colorado could decide the U.S. Senate control with Gardner vs. Udall race. But, the state could provide the seawall to any anti-Washington wave coming out of D.C. as it did in 2010. What a great state if you like to watch American politics! The first post-Labor Day polls are mostly good news for Democrats. 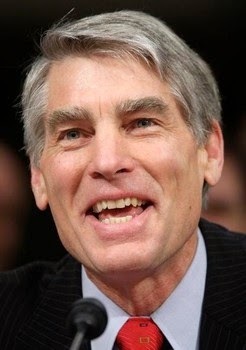 Mark Udall’s lead of six points in the new NBC/Marist poll will reinforce the Democrats’ campaign strategy of “all reproductive rights advertising all the time.” Expect to see the Romanoff’s campaign to start to highlight the issue and many other Democrats. John Hickenlooper is still in what appears a closer race with Bob Beauprez. If you asked the state’s political class who was the least vulnerable between Hickenlooper and Udall, Hickenlooper would have won hands down last winter and spring. But, repeated polls have shown him in a close race whereas Udall appears to have a near margin of error lead. One difference between the NBC/Marist survey and Rasmussen in the governor’s race is the naming of two third party candidates – libertarian and Green Party. Together, they are taking nine percent of the vote, no doubt some from each of the frontrunner candidates. The Hickenlooper campaign must have some angst over the closeness of the race. 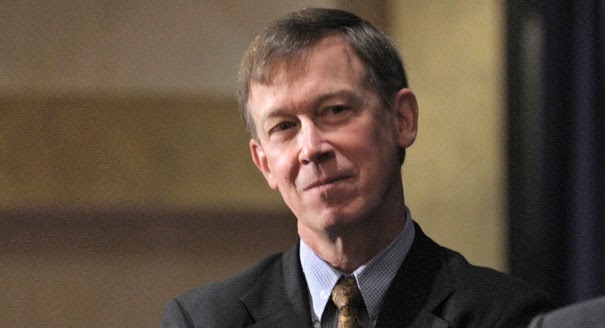 Hickenlooper has many people who like him, but he generates little passion, especially among the rank and file Democratic core constituencies. In fact, he has especially alienated the environmental community. Hickenlooper’s advertising is just starting. The ads will likely try to reestablish the non-politician with some humor image that made his career. Also expect to see a lot of flood waters. But no doubt his “feisty” demeanor at the Club 20 debate reflects his frustration with his weak numbers. Although Hickenlooper has no paid critical advertising of Beauprez, independent PACs are lurking and they may step up to help the governor. I did an interview with Stuart Varney, filling in for a vacationing Neil Cavuto. He used the first New Hampshire poll (Aug. 22) showing Scott Brown only two points behind Democratic incumbent Senator Jeanne Shaheen as a jumping off point for a description of the pre-Labor Day U.S. Senate forecast. Brown remains an underdog to win the seat, but most forecasts using historical data and the latest polls still give Republicans a better than 50 percent chance to win six seats and take control of the U.S. Senate. Up to late August, the forecasts are driven primarily by historical data. For example, weighing a senate race where Romney got more votes than Obama in 2012, to giving the Republican candidate an edge. But after Labor Day, the polls in each state will become dominant in the models and the Democratic strategy of running strong localized races, especially with incumbents, gets tested. There are two models from Democratic websites (Huffington Post and Kos) that show Democrats holding the senate. But, the mainstream sites (i.e., major papers, Nate Silver, etc.) still see Republicans with a slight edge to win six seats. The different forecasts should converge, and it appears the races will tighten because several Democrats are indeed performing better than the forecasts predicted. Although the campaign for U.S. Senate in Colorado has already spent more than $10 million trying to convince voters of the flaws in opponents and merits in themselves, the attention will now ramp up as public polling results become more frequent, voters get more attentive and their positions more firm. Control of the U.S. Senate is in play with a narrow advantage to the Republicans. But, no wave is detected; hence, the final decision will likely be localized; i.e., are good candidates and campaigns being run, which may help Democrats possibly hold onto a few races and score an upset (Kentucky, South Dakota, Georgia). Udall still appears ahead in Colorado. His campaign focuses on gender issues. His and Gardner’s strategies are being closely watched nationally. The wave, that is a trend, could start late during the final week of early and Election Day voting. There the Republicans have the advantage. The message of “time to change D.C.” is strong and is mostly anti-Obama. President Obama’s political campaigns have seemed highly attuned to the shifts in public opinion while his policies (and their implementations, aka Obamacare) have more often than not fallen flat. After a month of White House leaks about an aggressive change in the nation’s deportation laws, Obama’s political team seem to have gotten the memo. Unfortunately for them, they again look confused and politically disingenuous. The surge to the southern border has shifted public opinion pluralities from helping millions of undocumented citizens to tighter border enforcement. The latest Pew Research poll (9-3-14) shows a ten-point shift from helping people become citizens to border security since early 2013 when the President proposed immigration reform as a top second-term agenda item. Some of the most vulnerable politicians to the President’s aggressive policy will be senators in battleground states. For example, New Hampshire, Arkansas and North Carolina where Democrats are already under assault in ads accusing them of being for amnesty. Gallup reports immigration is a top issue for Republicans (8-22-14) and they shifted much more to border security than the rest of the population (53% in 2014 from 36% in 2013), hence, the special problem in battleground states. Along with endangering vulnerable senate Democrats, the President’s preference for aggressive, non-legislative solutions engenders considerable negative reaction and commentary. In Colorado, Democrats have tried to use immigration as a part of “my opponent is extreme” theme. As the issue has shifted, that argument has no traction. Politico reported (8-21-14) that immigration is not a major issue even in the highly competitive 6th Congressional District, which has a 20 percent Hispanic population. “The national narrative’s wrong,” said Floyd Ciruli, an independent pollster here and a longtime observer of Colorado politics. For most voters, he said, immigration is the sixth or seventh most important issue. John Hickenlooper wants to talk about the economy and accomplishments, but keeps backtracking over the actions of 2013, the year his political career began to list to the left and his approval sank 20 points in less than 12 months. After some correcting and getting up a little speed in early 2014, the Governor repeatedly gets into topics that will hurt him. He brought up guns with the state’s leading gun rights advocates, County sheriffs, and that pulled him off message for a couple of weeks. He ended August and headed into the final campaign turn opening up a debate on his very poorly received death penalty decision. Denver pollster Floyd Ciruli said Hickenlooper can only blame himself for repeatedly reviving an issue that repeatedly hurts him. The issue was part of Hickenlooper’s tipping point in 2013, Ciruli said, when he granted Dunlap the reprieve, helping drive down his approval ratings from results above and just below 60 percent to the low 40s. By saying he might grant clemency if he loses, Hickenlooper didn't portray himself as a thoughtful leader, the pollster said.